Wargaming broadly falls into three categories — paper-and-pencil games, board games and miniatures gaming. Dungeons & Dragons is the classic pencil-and-paper game, with games played out largely through verbal role-playing with a lot of note-taking and mapping on paper. Board games are great to pull off a shelf, set up and play, often in one sitting. Miniatures wargaming is my favorite. 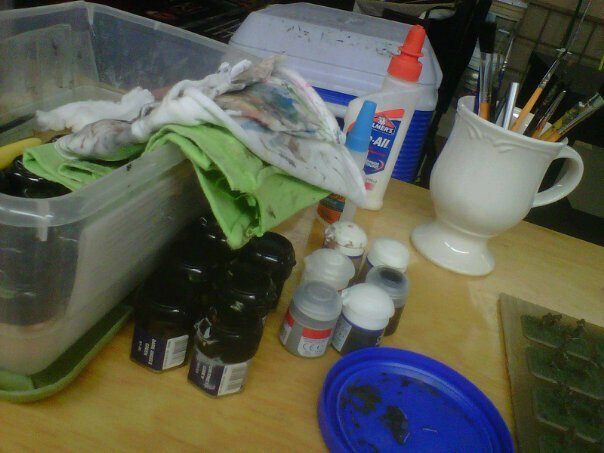 The hobby combines two entirely different aspects – painting and playing. Firstly, miniatures wargaming involves obtaining often hundreds of plastic or metal figures in various sizes from just a few millimeters to nearly two inches tall. A fair amount of research usually goes into creating forces of the proper size and and make up. Then there’s a lot of gluing to get poses and equipment together in realistic and historically-accurate configurations. Lastly, a miniatures modeller is faced with hours and hours of painting with tiny brushes, dabbing paint on uniforms, weapons, gear and exposed faces and hands. Even within the same historical era, say WWII or the American Civil War, there are nearly-limitless variations in how miniatures can be painted. Beyond the figures themselves, setting up a wargame usually involves creating terrain including buildings, trees, rivers, roads and hills. Only after you’ve logged many hours painting up your armies and laying out your terrain can the miniatures wargamer get on to the second half of the hobby — actually playing. Again, miniatures wargaming has a tremendous variety of rulesets available depending on the era, scale and size of a game desired. Some games might involve skirmish-level battles with just a couple dozens figures on a side and other games can be of a grand tactical scale with hundreds (or thousands) of troops filling the field. Rulesets can run from just a few pages to dozens of books, and some gamers choose to write their own “home-brewed” rules. Some companies such as Flames of War or Games Workshop manufacture self-contained systems of miniatures and rules, even offering some starter sets of figures, rules, paints and dice all in one box for new players. For a glimpse at the intersection of painting and playing wargames, check out the newly-updated pages on my Gaming and Painting page. Whether it’s World War II, the American Civil War or the Anglo-Zulu War, each era and scale brings different variety to what I love about the hobby.